With one of the longest and most controversial careers in Hollywood history, Blake Edwards is a phoenix of movie directors, full of hubris, ambition, and raving comic chutzpah. His rambunctious filmography remains an artistic force on par with Hollywood’s greatest comic directors: Lubitsch, Sturges, Wilder. Like Wilder, Edwards’s propensity for hilarity is double-helixed with pain, and in films like Breakfast at Tiffany’s, Days of Wine and Roses, and even The Pink Panther, we can hear him off-screen, laughing in the dark. And yet, despite those enormous successes, he was at one time considered a Hollywood villain. After his marriage to Julie Andrews, Edwards’s Darling Lili nearly sunk the both of them and brought Paramount Pictures to its knees. Almost overnight, Blake became an industry pariah, which ironically fortified his sense of satire, as he simultaneously fought the Hollywood tide and rode it. Employing keen visual analysis, meticulous research, and troves of interviews and production files, Sam Wasson delivers the first complete account of one of the maddest figures Hollywood has ever known. "Sam Wasson has undertaken nothing less than the critical resurrection of Blake Edwards, whose 40-film career, by turns good, great, bad, but never indifferent, has been ridiculously underrated by the critical establishment. Wasson very readably displays the scholarly background, writing skills, historical sophistication and balanced judgment to succeed in his objective. One hopes this impressive work will inspire a splurge of revivals and retrospectives of this more than intermittently hilarious filmmaker." 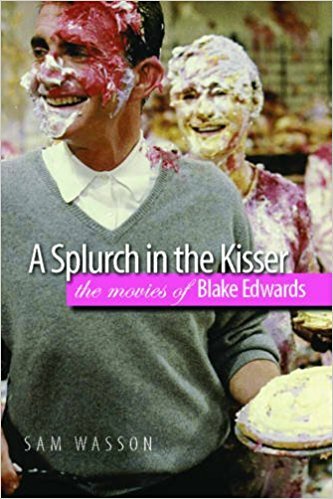 "In making his case for Blake Edwards as a unique observer of the human condition, for whom comedy is often associated with pain, Wasson begins with a description of the word gag. ‘The word itself is dumb,’ he writes. ‘It sounds dumb. Gag. Like the sound a baby makes. It’s also ugly. The dorsal consonant G, first at the beginning, and then at the end, comes up like mud in the throat, and that A in between is just plain flat. Speaking it feels like talking with a mouthful of tuna fish.’ What a welcome notion: somebody who knows how to write funny is doing a serious book about comedy!" "Reading Wasson’s book is like having a couple of beers with your friend, the Blake freak. I was continually amazed at the exacting nature of the descriptions of shots and sequences and the intelligence of the analysis that grows out of them." "With this title, Wasson fulfills the goal of the 'Wesleyan Film' series, which aims to produce books that are 'rigorous, critical, and accessible both to academics and to lay readers with a serious interest in film.' The study is a pleasure to read, primarily because the author is a fan and intimate with the details of the thematic content and style of Edwards's films."